*Fundraisers must be booked at least 3 months apart for the same organization and are limited to twice a year for schools and churches, other organizations may be limited to once a year. You must submit your 501(c)3 when booking your fundraiser with us. Our mission is to focus on schools, churches or other non-for-profits that focus on children and we have the right to refuse any organization for any reason. Fundraisers may not be booked for individual persons or individual sports teams. For example: Johnny’s baseball team can book the event but must advertise to the entire league and the check must be written to Lakeland City Baseball and not the individual team. I wanted to let you know just how much we appreciate you and your generosity. Mckeel Academy Central has hosted two school fundraisers which have been more than successful and our school has been extremely satisfied with the results. Scheduling our event was so easy and not having to pay to rent the facility was huge! You have given $1,000.00 to Mckeel after each fundraiser and we couldn’t be more grateful. Not only do the Skate nights bring in funds for our school and students but what you have given back to Mckeel has been overwhelming! Your facility is stocked, clean and well organized. The Cafe has much to choose from and the staff are polite, knowledgeable of their job and very helpful. 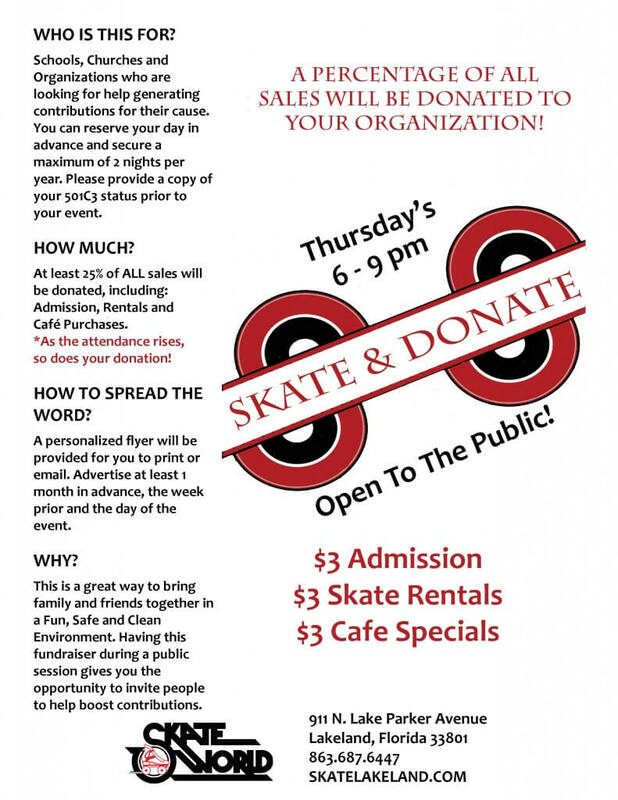 We will continue to have fundraisers with Skate world and I will continue to spread the word of your great establishment! Mckeel can’t thank you enough. Thank you for giving us the opportunity to serve our community! We have been able to donate to these following schools and other non-for-profit organizations.